The Macedonians were of Hellenic stock, claiming legendary descent from the Dorians who conquered Sparta and much of Greece towards the end of the Mycenaean period. Their name is generally thought to mean 'highlander', which would be entirely appropriate for their mountainous homeland. They probably arrived in the northernmost parts of Greece on the tail-end of the Dorian influx during the ninth century BC, coming in from the west and driving the Thracians out of Mygdonia in the process. Neighbouring the friendly Hellenic kingdom of Epirus on their western border, The Macedonians also had Paeonia to the north, Thrace to the east, and Thessaly to the south. Like the Thracians, with whom they had many cultural similarities, they were an aggressive people, perfectly suited to the more mountainous land in which they settled. While they later become more Hellenised from the fourth century, the more southerly Greeks regarded them as being rough and ready, still semi-barbarians. Their culture bore some similarities with that of their Indo-European cousins, the Celts, in that they would seemingly fight anyone, especially each other. Partially symptomatic of a culture that did not especially set out laws and which did not especially respect any laws that were set out, Greek history is rife with rebellions, pretenders, and civil wars, so much so that towards the end of the Hellenic period they essentially self-destructed their empires, effectively handing them over to Rome to replace them as the dominant force in the ancient world. Legendary son of Aristomachus of Sparta. King of Argos. Greek myth paints Caranus as the son of Temenus, king of Argos, who in turn is the son of Aristomachus, the Dorian conqueror of Laconia (although given dating discrepancies between Caranus and Aristomachus, it is more likely that he claims descent from the latter rather than being his actual son). According to the Chronicon by Eusebius, Caranus takes his followers north to aid the king of the Orestae, who is at war with his neighbours, the Eordaei. The Orestae (possibly an Epirote tribe) occupy a location in central northern Greece, immediately north-west of Mount Olympus and west of the Eordaei. The king promises Caranus half his territory in return for his successful aid. The Orestae are indeed successful and the king keeps his promise. Caranus takes possession of the territory, founding the very beginnings of the Macedonian kingdom and reigning for thirty years, eventually dying of old age. He is succeeded by his son. The Macedonians appear to enjoy close and friendly relations with the Epirotes from the very beginning, which supports the idea that the Orestae themselves are Epirotes. Son. Macedonian tribal king. Reigned 12 years. Son. Macedonian tribal king. Reigned 28 years. A Macedonian kingdom only emerged around the end of the eighth century under the Argead line of kings. According to legend, they migrated into the region from Argos under Caranus, hence Argead ('of Argos'). Once there they helped the king of the tribal Orestae to defeat a neighbouring tribe and were given half the king's territory in thanks. This must have been the eastern half, and three or four generations later, either Perdiccas or Argaeus established a capital at Aigai (or Aegae, modern Vergina, near Veria), east of both the former Orestae and their neighbours, the Eordaei, and close to the northernmost point of the Aegean Sea. 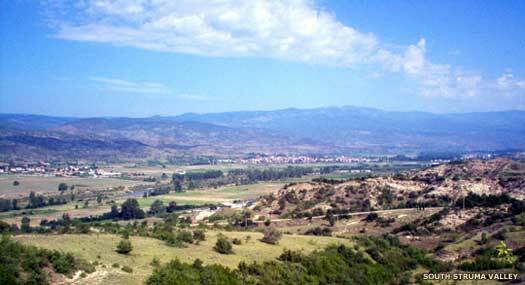 The region was in a fertile plain in Lower Macedonia which was irrigated by two rivers, the Axius and the Haliacmon. Under Alexander I the kingdom expanded rapidly and, until the fourth century, occupied an area approximately the same as the modern Greek province of Macedonia. First historical king according to Herodotus. Son. Founder of the Argeads. Faced Galaurus' Illyrian invasion. The Illyrian invasions which had begun during the reign of his father continue during Philip's reign. He resists successive attempts to invade his small kingdom but is eventually killed by them in battle. His infant son inherits the kingship. The Macedonians are dispirited by the continual Illyrian attacks against them, which have lately been joined by Thracian attacks. Believing that the presence of their king will strengthen then, the Macedonian army carries the infant Aeropus into battle. The attempt works, and the Illyrians and Thracians are finally driven from the region. The king reigns in apparent peace thereafter. Son. A Persian vassal for much of his reign. There is a period of Persian overlordship, although Amyntas is still able to enter into an alliance with Hippias, tyrant of Athens. Macedonia remains a vassal until it manages to break free under the rule of Alexander I.
Neighbouring Thrace south of the Danube is conquered by the Persians and is held for about fifty years. This could be the satrapy known as Skudra into which Macedon is merged during this period. (The source of the name 'Skudra' is 'Saka' or 'Scythian', both themselves variations of the same thing - Indo-European tribesmen of the Pontic-Caspian steppe.) King Amyntas is its local governor, with this minor satrapy being subjoined to the great satrapy of Sparda. Son. Built up the kingdom from its tribal origins. In response to the Athenian support of revolts by Salamis and the Ionians, Darius I invades mainland Greece, subduing the Thracian tribes along the way (all except the Satrai, precursors to the Bessoi). Athens is sacked, but only after its citizens withdraw safely, and subsequently the invaders are defeated by Athens and Plataea at the Battle of Marathon in August or September of the year. Invading southern Greece in 480 BC, the Persians are swiftly engaged by Athens and Sparta in the Vale of Tempe, and then stymied by a mixed force of Greeks led by Sparta at Thermopylae. While Macedonia is a Persian vassal, it still supplies the Greek city states with supplies and information regarding Persian movements. Athens, as the leader of the coalition of city states known as the Delian League, then defeats the Persian navy at Salamis, and after the Persian king Xerxes returns home, his army is decisively defeated at the Battle of Plataea and kicked out of Greece, with many of the survivors of Plataea being killed by Alexander's forces as they retreat to Asia Minor by land. This defeat also allows the Macedonians to fully regain a freedom that they may have established in 490 BC. Colchis, too, is free by now. During his reign, Alexander I leads the expansion of the kingdom's territory into Upper Macedonia, conquering independent Macedonian tribes such as the Elmiotae (immediately south-west of Aigai) and the Lyncestae (to the north-west). He also takes other tribal centres including Eordaia (home to the tribe that had been defeated by Caranus and the tribal Macedonians in the early eighth century), Bottiaea (home to a possibly aboriginal people), Pieria (immediately south of Aigai and bordered on its own south by Pelasgiotis which is either home to a population of Pelasgians or remembers their former existence there in its name), Mygdonia (home to Thracians), and Almopia (home to the Almops). Son. An alcoholic, he was killed by Archelaus, his nephew. The Macedonian kingdom formed by Alexander begins to disintegrate under his successors. The alcoholism of Alcetas, and the in-fighting between Perdiccas and Phillipus allows the Macedonian and other subject tribes regain autonomy. Perdiccas' subsequent reign sees him involved in the prelude to the Peloponnesian Wars, in which he frequently switches sides between Athens and Sparta in their growing conflict. Brother. Took the throne following the murder of his brother. Brother. Challenged Perdiccas for the throne. 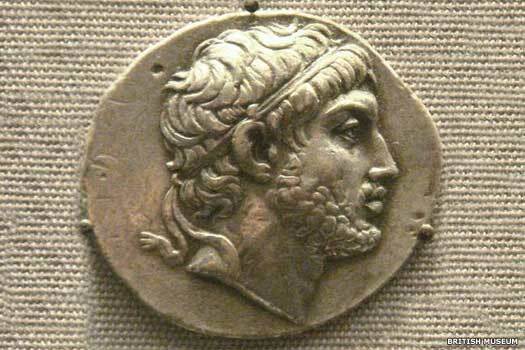 Against the backdrop of the Second Peloponnesian War, Perdiccas is opposed by Amyntas II, the son of either Phillipus or Menelaus. He seeks the support of Sitalces, king of the Odrysian Thracians, but Perdiccas mediates with Seuthes, the son of Sitalces to obtain peace between the Thracians and Macedonia. Amyntas is forced to wait for his accession. Son of Perdiccas. Gained the throne by murdering all rivals. One of the first acts of Archelaus is to stabilise relations with Athens, supplying it with wood with which to build a new fleet after its disastrous defeat at Syracuse. He also stabilises the kingdom, improving its organisation and infrastructure by building strongholds and roads. By the time of his (possibly accidental) death during a hunt at the hands of Craterus, one of the royal pages, Macedonia is a significantly stronger kingdom. Royal page who killed the king. Seized throne for 4 days. Brother of Orestes. Patron of arts & literature. Killed hunting. A period of confusion follows the unexpected death of Archelaus II. The subsequent kings rule for brief periods, with little information regarding them. The kingdom probably fractures under the strain of a virtual royal civil war while the neighbouring regions remain barbarous and untamed. Son of Phillipus or Menelaus, brother of Perdiccas. Son of Aeropus II. Assassinated by Amyntas III. Son of Arrhidaeus. Driven out by the Illyrians. Amyntas III is driven out of the kingdom by the Illyrians who are assisting the pretender to the Macedonian throne, Argaeus. It takes the rightful king just a year to regain his throne, with support from the Thessalians. Pretender. Probably returned in 359 BC. Restored. Died of old age. During the first years of his reign Amyntas III creates a fully unified Macedonian state which heralds a period of greatness. Around this time he also establishes good relations with Cotys of the Thracian Odrysian kingdom which presages even closer relations under Philip II. Son. Assassinated by Ptolemy I. Brother. Forced to accept regent. Killed in battle by Illyrians. Brother-in-law and regent. Killed by Perdiccas III. Athens and Sparta, together with the Eleans and the Mantinaeans, are defeated by the Thebans at the Battle of Mantinea. The battle is fought on 4 July, with the Thebans being supported by the Arcadians and the Boeotian League. The Spartan defeat paves the way for Macedonian supremacy later in the century. Infant son of Perdiccas III. Usurped by Philip II. As soon as Phillip II deposes his infant nephew and claims the throne for himself, the pretender, Argaeus, attempts to secure the throne with Athenian support. Philip manages to persuade the Athenians not to interfere. Argaeus gathers his supporters, along with some freelance Athenians, and attempts to capture the capital by force but is repulsed. While retreating back to his headquarters at Methone, he is ambushed by Philip and defeated. He either dies during the fighting or is executed afterwards. Probably the same as the Argaeus of 393 BC. Brother of Perdiccas III. Assassinated. Philip makes an alliance with Cotys of the Thracian Odrysian kingdom. In the same year he marries Olympias, the niece of King Arybbas of Epirus. The union is partly to combine resources to ward off the dangerous Illyrian tribes to the north-west, but it also cements an alliance between the two kingdoms that helps to forge an empire. Artabazus II, satrap of Phrygia, falls out with Persian King Artaxerxes III and takes refuge at the court of Philip II. When Artabazus discovers Philip's designs to invade Persia, he returns there with his family, is pardoned, and is enrolled amongst the closest companions of the great king. His sons are given distinguished commands, with one son, Ariobarzanes, becoming satrap of part of Persis (at least, according to Arrian of Nicomedia, who calls him 'satrap' of Persis). At the same time, the new ruler of the Odrysian kingdom makes an enemy of Philip so he undertakes a successful expedition into Thrace, gaining ascendancy for a time. The Odrysian king subsequently throws off Macedonian control, so a second expedition in 343 BC gains Philip complete dominance by 341 BC. Philip defeats the Greek states at the Battle of Chaeronea and gains overlordship over all of Greece, including Athens, Corinth and Sparta. Athens and other city states join the Corinthian League (or Hellenic League) which is formed by Phillip to unify the military forces at his command so that he can pressure Persia. The invasion of Persian Anatolia has only just begun when Philip is assassinated at his capital in October of the year. The court gathers for the celebration of the marriage between Alexander I of Epirus and Philip's daughter, during which Philip is killed by Pausanias of Orestis, one of his seven bodyguards. 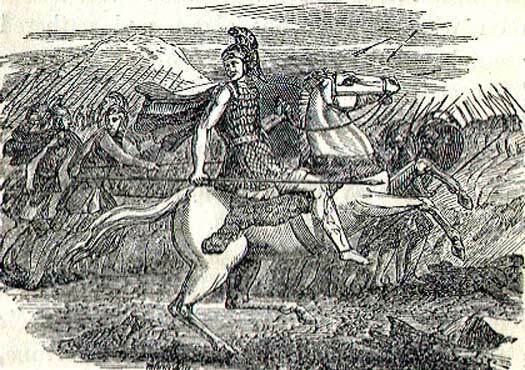 Pausanias tries to escape and is pursued by three more of Philip's bodyguards, dying at their hands. Thanks to foundations laid by his father, Phillip II, the Macedonians reached their greatest extent under Alexander the Great, becoming for a short time the greatest power in the world. 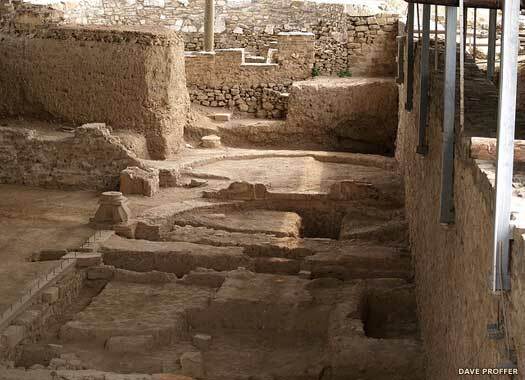 Following Alexander's early death the kingdom broke up into several Hellenic sections which maintained Greek cultural influence across a great span of the ancient world for several centuries. Alexander's immediate successors held no real power, being mere figureheads for the generals who really held control of Alexander's empire. During the course of civil wars and negotiations for control of various sections, the territories were divided up into separate kingdoms which were firmly established by 305 BC. Son. 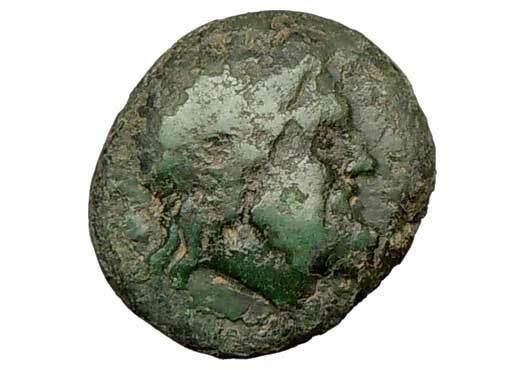 Born 356 BC to Philip II and Olympias of Epirus. Probably sensing that the period of transition between one overlord and his successor is the best time to mount such an attempt, the Thracians revolt against Macedonian rule. Unfortunately for them, Alexander immediately mounts a campaign which conquers two of their tribes, bringing capitulation from the rest. Viceroy & regent of Macedonia during Alexander's conquests. In 334 BC Alexander launches his campaign into the Persian empire by crossing the Dardanelles. The first battle is fought on the River Graneikos (Granicus), eighty kilometres (fifty miles) to the east. The Persian defeat forces Satrap Arsites of Daskyleion to commit suicide. Sparda surrenders but Karkâ's satrap holds out in the fortress of Halicarnassus with the Persian General Memnon. The fortress is blockaded and Alexander moves on to fight the Lycian mountain folk during the winter when they cannot take refuge in those mountains. The campaigning season of 333 BC sees Darius III and Alexander miss each other on the plain of Cilicia and instead fight the Battle of Issos on the coast. Darius flees when the battle's outcome hangs in the balance, gifting the Greeks Khilakku and Cappadocia, although pockets of Persian resistance remain in parts of Anatolia. Alexander proceeds into Syria during 333-332 BC to receive the submission of Ebir-nāri, which also gains him Harran, Judah, and Phoenicia (principally Byblos and Sidon, with Tyre holding out until it can be taken by force). Athura, Gaza, and Egypt also capitulate (not without a struggle in Gaza's case). Now, in 331 BC, he is ready for the expected confrontation with Darius III in the heartland of Persian territory. While Alexander is campaigning in Asia, Sparta rebels against Macedonian hegemony in Greece with allies from Elis, along with most of Achaea and Arcadia. Antipater marches a large army south and defeats the rebellion after a desperate struggle. At the same time in 331 BC, the Battle of Gaugamela sees Alexander's main army take on the massed forces of Persian King Darius III. After a furious encounter with heavy casualties, the Persians start to break. Darius flees the battlefield and heads eastwards, leaving the defence of each of his provinces to its satrap. Alexander seizes Babylon and Susa and, having gathered intelligence on Persis, he immediately captures that too. Alexander's campaigns to the far east of Babylonia take him and his army into unknown territory. Haraiva is conquered late in 330 BC, and Uwarazmiy welcomes Alexander. In 329 BC, he campaigns briefly in the southern Indus before entering Bactria by the back door (via the Hindu Kush). There, with the help of the Sakas and other subject groups and allies, he is able to seize and execute Bessus, the would-be Achaemenid ruler. 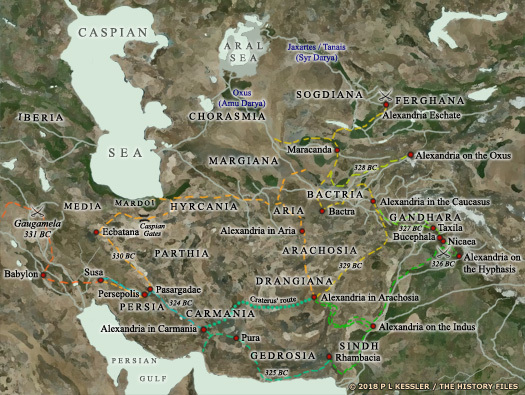 During his subsequent conquest of Sogdiana, Alexander focuses on the largest and best-defended of seven towns in the region, this being Cyropilis in the Ferghana region. While he takes the other towns, he sends Craterus to pin down the defenders of Cyropolis. Following the quick fall of the other towns, the storming of Cyropolis is led by Alexander in person. Both he and Craterus are wounded but the town and its central fortress are taken. Against the vehemently strong opinions held by his generals, Alexander proceeds to marry Roxana. She is the daughter of Oxyartes, a Sogdian warlord who had supported Bessus in his attempt to resist Alexander in the east in 329 BC. Oxyartes himself had been one of the defeated defenders of the fortress known as the 'Sogdian Rock' in 328 BC, close to the Sogdian capital at Marakanda. Oxyartes himself is made satrap of Gandhara. Alexander's army enters western India through the passes of the Hindu Kush, aided by King Ambhi of Taxila on the eastern bank of the River Indus and by the Indo-Scythians under Omarg. In support of Ambhi, Alexander fights King Porus of the neighbouring Paurava kingdom, defeating him at the Battle of Hydaspes and then raising both kings as satraps of their respective northern Indus regions. Presumably both are under the administrative gaze of the Greek satrap of northern Indus, Eudamus. But the troops rebel against the prospect of more battles against the great army of the Nandas in India, on the Ganges. Alexander is forced to retreat, abandoning his hopes of conquering India. While he has been away, Aspastes, satrap of Carmania, has attempted a rebellion. Now he meets Alexander in neighbouring Gedrosia and is promptly executed for his treason. It is reported to Alexander while he is in Carmania that Abisares, king of the mountain domain of the same name in the Northern Indus province, has died, to be succeeded by his son, also known as Abisares. Alexander confirms him in his position, although the Greeks are not particularly well placed to do anything other than this. Their control of the far eastern areas of the Indus has already faded, leaving Abisares largely independent of them. Nothing more is known of him or his kingdom. When Alexander returns from his long expedition into India, towards the latter end of 325 BC, eight satraps and generals are removed from office and executed. Most are guilty of assuming that Alexander would not survive and had begun to exploit his empire for their own personal benefit. To prevent similar problems in the future, all satraps were ordered to disband their mercenary forces. Satraps Abulites and Oxathres of Susiana and Paraetacene are amongst the dead, apparently killed by Alexander in person using a javelin. Following Alexander's return from India, Satrap Philip of northern Indus is assassinated as the result of a conspiracy which has been formed amongst mercenary troops under his command. This appears to be with the encouragement of Chandragupta who is already busy forming his Mauryan empire in India. Alexander names Eudamus and Taxiles as the rulers of his territories in northern Indus until an official replacement can be sent. It is likely that Alexander dies before this takes place. Alexander holds an event in Susiana which has become known as the 'Susa Weddings'. His intention is to unite Persians and Macedonians symbolically by carrying out a mass joining of prospective couples in a single ceremony. He takes a Persian wife himself and arranges many Persian wives for his officers. Persian custom allows multiple wives, so the fact that Alexander is already married to Roxana of Sogdiana is not a hindrance. His second wife is Stateira II, eldest daughter of the late Darius. Alexander may also have taken a third wife at the same ceremony, Parysatis, youngest daughter of Artaxerxes III (the late great-uncle of Darius and a former Persian king in his own right). Following Alexander's premature death, his first wife, Roxana, murders his second, Stateira, and possibly her sister, primarily to remove competition in the succession. All of the surviving Macedonian officers also divorce their own Persian wives, ending any pretence at Macedonian-Persian unity. Immediately, a coalition of Greek cities springs up with the intention of detaching Greece from the Macedonians, including Athens and the Aetolian League. Despite two impressive victories in battle on land, the allies are undone when the Athenian navy fails to secure control of the seas. The Macedonians are able to bring in reinforcements and the war ends in victory for the Macedonians and their Boeotian allies. The Macedonian General Leonnatus, satrap of Phrygia, has been killed in the process of gaining it, however. As far as the empire is concerned, Alexander's two successors are retained as figureheads while the empire is governed by his powerful generals. Perdiccas, the leading cavalry commander, is the first general to rule, carrying the title 'Regent of Macedonia', first with Meleager, head of the infantry officers, as his lieutenant, but alone after he has him murdered. In the west it is made up of Ptolemy in Egypt and Libya; Laomedon in Syria and Phoenicia; Philotas in Cilicia; Peithon in Media; Antigonus in Lycia and Pamphylia; Asander in Caria; Menander in Lydia; Lysimachus in Thrace and Hellespontine Phrygia; Neoptolemus in Armenia. Macedon and the rest of Greece fall under the joint rule of Antipater and Craterus (Alexander's most able lieutenant), while Alexander's secretary, Eumenes of Cardia, gains Cappadocia, Mysia, and Paphlagonia. In the east, Alexander's arrangements remain largely intact: Ambhi and Porus rule over their Indo-Greek kingdoms, namely Taxila and Paurava (seemingly at the expense of Eudamas as satrap); Alexander's father-in-law Oxyartes rules Indo-Greek Paropamisadae; Sibyrtius rules Indo-Greek Arachosia and Gedrosia; Stasanor rules Indo-Greek Aria and Drangiana and then later Bactria and Chorasmia; Philip rules Bactria and Sogdiana; Phrataphernes rules Parthia and Hyrcania; Peucestas governs Persis; Archos governs Susiana; Tlepolemus governs Carmania; Atropates governs northern Media; Archon rules Babylonia; and Arcesilas rules northern Mesopotamia. Son of Philip II. Feeble-minded. Titular king. Son of Alexander and Roxana. Titular king. The First War of the Diadochi (the successors - the generals of Alexander's army) sees civil war break out between the generals, and Perdiccas is murdered by his own generals during an invasion of Egypt. Philip III agrees terms with the murdering generals and appoints them as regents. Craterus, who had taken part in Alexander's campaigns in Hyrcania and Sogdiana, is killed while fighting against Eumenes. A new agreement with Antipater makes him regent of the empire instead and commander of the European section. Antigonus remains in charge of Lycia and Pamphylia, to which is added Lycaonia, Syria and Canaan, making him commander of the Asian section. Ptolemy retains Egypt, Lysimachus retains Phrygia and Thrace, while the three murderers of Perdiccas - Seleucus, Peithon, and Antigenes - are given the former Persian provinces of Babylonia, Media, and Susiana respectively. Arrhidaeus, the former regent, receives Hellespontine Phrygia, while Tlepolemus is again confirmed in Carmania. Eudamus regains control of the Northern Indus and kills one of the local satraps, King Porus, between 321-315 BC. Restored as regent of Macedonia. Regent of Macedonia. Deposed in the Second Diadochian War. The death of Antipater leads to the Second War of the Diadochi. He had passed over his son, Cassander, in favour of Polyperchon as his successor (possibly to avoid claims of dynasticism) but the two rivals go to war. Polyperchon allies himself to Eumenes (Alexander's secretary, former satrap of Cappadocia, Mysia, and Paphlagonia), but is driven from Macedonia by Cassander, and flees to Epirus with the infant Alexander IV and his mother Roxana. 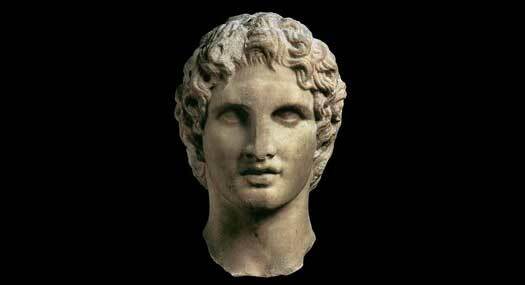 Philip III is killed by his stepmother, Olympias, in 317 BC who is herself killed by Cassander the following year. Cassander also captures Alexander IV and Roxana and installs a governor in Athens, subsuming its democratic system. Eumenes is defeated in Asia and is murdered by his own troops, and Seleucus is forced to flee Babylon by Antigonus. The result is that Cassander controls the European territories (including Macedonia), while the Empire of Antigonus controls those in Asia (Asia Minor, centred on Phrygia and extending as far as Susiana), and also temporarily some of the eastern territories, including Aria, Drangiana, and Parthia. Polyperchon remains in control of part of the Peloponnese. Despite siding with the losing side under Eumenes, Tlepolemus is allowed to remain in Carmania. Regent of Macedonia. Son of Antipater. Claimed crown (305 BC). The Third War of the Diadochi results because the Empire of Antigonus has grown too powerful in the eyes of the other generals so Antigonus is attacked by Ptolemy (Egypt), Lysimachus (Phrygia and Thrace), Cassander (Macedonia), and Seleucus (Babylonia). The latter re-secures Babylon itself, plus Carmania, and the others conclude peace terms with Antigonus in 311 BC. Antigonus continues to fight Seleucus for Babylon but he is defeated in 309 BC and withdraws. At around the same time, Cassander murders the fourteen year-old Alexander IV and his mother, Roxana, ending the Argead line of Macedonians. The Fourth War of the Diadochi soon breaks out. In 306 BC Antigonus proclaims himself king, so the following year the other generals do the same in their domains. Polyperchon, otherwise quiet in his stronghold in the Peloponnese, dies in 303 BC and Cassander claims his territory. The war ends in the death of Antigonus at the Battle of Ipsus in 301 BC. Lysimachus and Seleucus divide Antigonus' Asian territories between them, with Lysimachus receiving western Asia Minor (the Lysimachian empire, including Pergamum and Phrygia), and Seleucus the rest (the Seleucidire, including Susania, Babylonia, Bactria, Carmania, and the Indo-Greek provinces), except Cilicia and Lycia, which go to Cassander's brother, Pleistarchus, and Pontus, which becomes independent, and Phrygia itself, which apparently remains with or is reclaimed by Antigonus' son. Cappadocia is briefly usurped by Amyntas before Seleucus seizes control and permits the restoration of the native ruling dynasty there. Ptolemy remains secure in Hellenic Egypt, Libya, and Palestine. During the lifetime of Alexander the Great, while he was carving out his great Greek empire, Antipater served as his regent back home in Macedonia. Following Alexander's death, Antipater continued to act as regent for the king's brother and son. He also passed over his own son, Cassander, for the role of regent in favour of Polyperchon, so Cassander went to war against this general to assert his own claim to the Macedonian regency. He drove his rival out of Macedonia and captured Alexander's son and wife, putting him in the powerful position of controlling Alexander's European territories apart from the Peloponnese by 315 BC. The remaining wars between Alexander's generals did not change the ambitious Cassander's position in Greece, so he remained regent until he killed Alexander's son and wife in 309 BC (he had already killed Alexander's mother, Olympias, in 310 BC and had married Alexander's half-sister, Thessalonica, to secure his right to succeed the Argeads). From that point he was king of Macedonia in all but name, although he only proclaimed himself as such in 305 BC after Antigonus Monophthalmos had assumed the same title the year previously, forcing all the other surviving generals to copy him. Cassander was now undisputable (although not undisputed) king of Macedon, founding a new dynasty. Regent (317-306 BC). Proclaimed himself king of Macedonia. Cassander dies of dropsy, and his son, Philip, follows him due to natural causes less than a year later. The new dynasty is already in trouble, as Cassander's other two sons are involved in a dynastic dispute, meanwhile having to fend off Demetrius of the Antigonids. Brother. Ousted Alexander. Overthrown by Demetrius (to 279). Brother. Assassinated by Demetrius of the Antigonids. Alexander is ousted by Antipater, and turns to Demetrius of the Antigonids for help. The Antigonid king ousts Antipater, and subsequently has Alexander assassinated. Demetrius now rules Macedonia, albeit with various strong rivals ranged against him. The position of Demetrius as king is continually threatened, and eventually the combined forces of Pyrrhus (of Epirus), Ptolemy (of Egypt) and Lysimachus (of Thrace), assisted by the disaffected among his own subjects, oblige him to leave Macedonia in 288 BC. He passes into Asia and attacks Lysimachus' provinces but famine and plague destroys large numbers of his forces and he is abandoned by his troops on the field of battle, surrendering to Seleucus (of Syria and Babylonia). Lysimachus and Pyrrhus share Macedonia between them, but soon begin to fight, and Pyrrhus is ejected. King of Thrace. Killed by the Seleucids. Ptolemy II is the eldest son of Ptolemy of Egypt (it had been his younger brother who had ascended the Egyptian throne as Ptolemy II in 285 BC), and stays at the court of Lysimachus of Thrace until the king is killed by Seleucus, who is hoping to extend his own empire. Killing Seleucus in return, Ptolemy agrees an alliance with Pyrrhus of Epirus and marries Lysimachus' widow, Arsinoë, to gain the throne. Then he kills Arsinoë's two sons for conspiracy against him and Arsinoë flees to Egypt to seek protection from her brother-in-law. Ruler of the Lysimachian empire. Despite ruling both the Lysimachian empire and Macedonia, and having his main rival, the Antigonid King Antigonus II Gonatas bottled up in his own capital, Ptolemy is killed during an invasion of Greece by the hordes of the proto-Galatian Celts. The kingdom is plunged into anarchy as the Celts invade further into Greece, and only the Aetolians seem to be able to take the lead in defending Greek territory. Brother. Deposed by his troops after two months. Son of Cassander. Restored. Ousted by Sosthenes. Macedonia is weakened by the reigns of four short-lived kings. Meleager is forced to step down by his own troops after just two months, and his replacement, the returning Antipater II, governs for just forty-five days before being deposed by Sosthenes, a possible former officer in the army of the Lysimachian empire. Antipater remains a threat until he is defeated by the Antigonid King Antigonus II Gonatas (probably by 277 BC). He flees to his relatives in Egypt where he lives out the remainder of his life. Cousin? Army commander, not made king. Killed. 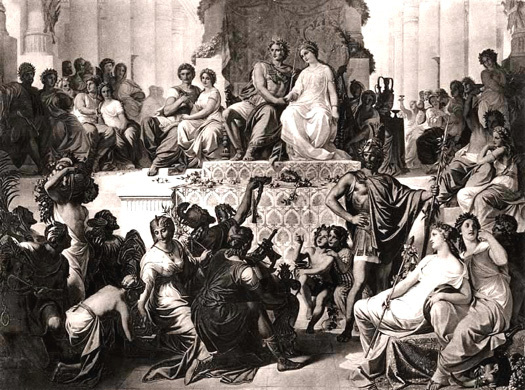 Sosthenes is elected king by the Macedonian army. His subsequent assumption of the title of king is doubted, with it seeming more likely that he remains strategos (military general). Apart from facing continual rivalry from Antigonid King Antigonus II Gonatas, during his short period in command Greece is still suffering from the invasion by Galatian Celts. Following a victory at Thermopylae, they are defeated by a force led by the Aetolians at Delphi in 278 BC, and then suffer a crushing defeat at the hands of Antigonus II in 277 BC. They retreat from Greece and pass through Thrace to enter into Asia Minor. The fate of Sosthenes is uncertain, but the vacant throne is soon claimed by Antigonus II. Antigonus II of the Antigonids was originally based in Phrygia, where his grandfather, the one-eyed Antigonus, had created an empire out of the former conquests of Alexander the Great. Since then three generations of Antigonids had constantly been at war with the other generals of the Greek empire as each of them jostled for superiority. Antigonus II defeated an army of invading Galatian Celts in 277 BC at a time when the Macedonian throne was weakened by continual changes of occupier, and by the Galatian invasion itself. Antigonus had already outlasted most of his rivals in Macedonia and the Lysimachian empire, and was now able to claim the vacant Macedonian throne, founding a new ruling house in Macedonia and Thrace combined that would last until Roman occupation ended independent Greek rule. The fact that he was the grandson of Antipater and the nephew of Cassander helped to reconcile most other Greek nobles to his rule. Son of Demetrius of the Antigonids. Just three years after claiming the Macedonian throne and uniting Thrace to it, Antigonus is attacked and easily defeated by Pyrrhus of Epirus, the former ally of Lysimachus. The Epirote king takes Macedonia for himself and rules it for the last two years of his life. The Celts invade again, destroying the Thracian kingdom and forcing the aristocracy to escape to the Greek colonies bordering the Black Sea, which include Pontus. 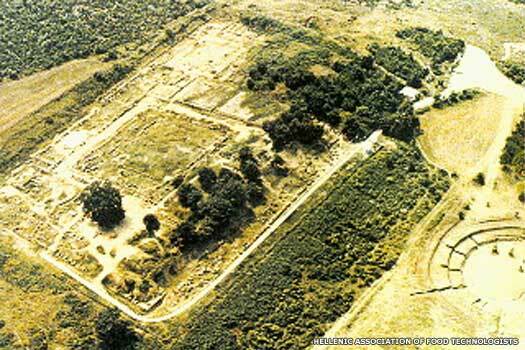 The kingdom of Galatia is created in Anatolia by the victorious Celts. Pyrrhus goes to war against Antigonus for his lack of support during the war against Rome, but finds himself trapped inside the walls of Argos with Antigonus surrounding him with superior forces. Trying to extricate himself, his unit of elephants is thrown into confusion and causes further chaos in which Pyrrhus is struck by a tile thrown by an old woman. Zopyrus, one of Antigonus' soldiers, kills the Epirote king. His entire veteran army goes over to the victorious Macedonian king, greatly increasing his power. Restored following the death of Pyrrhus. The Chremonidean War is fought between a coalition of Greek city states led by Athens and Sparta who are fighting for the restoration of their independence from Macedonian influence. They are aided by the Ptolemaic Egyptians who are naturally threatened not only by Antigonus' apparently peaceful rule of Greece, but by his friendship with the Seleucid empire. He temporarily loses control of most of the Greek city states to the south but, by 263 BC, has worn down both Athens and Sparta. Order and prosperity are restored in Greece. The interference by Ptolemy of Egypt continues, triggering the Second Syrian War. Macedonia and Antiochus II of the Seleucid empire team up to combine their attacks. Egypt loses ground in Anatolia and Phoenicia, and is forced to cede lands which include its ally, the city of Miletus. Son. May have been co-ruler from 257/256 BC. Determined to rule themselves rather than remain under the rule of kings, the people of Epirus form a republic called the Epirote League. Their former royal family are exterminated between 235 and about 233 BC, perhaps because their alliance with Macedonia is unpopular. It certainly serves to gravely weaken Macedonia. However, during his reign, Demetrius is able to extend the kingdom by taking Euboea, Magnesia, and Thessaly and its surrounding territory, although not Dolopia and perhaps also Peparethos and Phthiotic Achaia. Just a year after losing control of Pergamum, Demetrius dies shortly after a disastrous battle against the Dardanii on the kingdom's northern border. His son, Philip, is an infant, so his cousin is offered the throne as his guardian. He rescues the kingdom from collapse, and defeats the Dardanii, so he is persuaded to marry the widowed queen and take the throne for himself. It seems, however, that he is unable to keep the recently conquered Thessaly (and Phthia) within the kingdom. Cousin. Son of Demetrius the Fair of Cyrene. Despite securing the throne for himself, Antigonus III appears to view himself as a caretaker king for Philip V. He never tries to secure his own sons as heirs to the throne. Instead, he builds on his cousin's gains by re-establishing Macedonian power and dominance across the region, and in this year he overwhelms the Spartans at the Battle of Sellasia, ending any serious attempt by the Spartans to oppose Macedonian superiority in Greece. Although Greece is at peace, the Illyrians are a constant threat to the northern borders. They invade Macedonia and Antigonus has to rush north to defeat them in battle. He suffers a ruptured artery during the battle and dies. During the Second Punic War, Philip allies himself to Carthage. To avoid a possible reinforcement of Hannibal by Macedonia, Rome dispatches a force to tie down the Macedonians in the First Macedonian War. The war ends indecisively in 205 BC with the Treaty of Phoenicia. Even though it is only a minor conflict, it opens the way for later Roman military intervention in Greece. The Thracians eject the Celts of the kingdom of Galatia from Greece and restore Thracian rule. Philip conquers the kingdom of Thrace and permanently appends it to Macedonia. It remains part of Macedonian territory until the final end of the kingdom. The Second Macedonian War is triggered by claims made by Pergamum and Rhodes of a secret treaty between Macedonia and the Seleucid empire that is designed to carve up Egypt's possessions. Rome launches an attack and after a spell of indecisive conflict, Philip is defeated at the Battle of Cynoscephalae in 197 BC, while his general, Androsthenes, is defeated near Corinth. The Macedonian army is drastically reduced in size as a result of the defeat, and Philip's standing as an important Greek king is greatly diminished. Philip invites in a massive contingent of warriors from the tribe of the Bastarnae which resides to the north of the Danube. Apparently they are long-time allies of his and are needed to help him defeat the aggressive Dardanii, raiding Thraco-Illyrians who are located along his northern border and whom his diminished army is unable to defeat alone. However, the aged king dies before his allies can arrive. Now unsupported and without supplies, the Bastarnae pillage the land, although they are checked by Thracians who are on the defensive. About half their number return home while the rest press on for Macedonia where they are quartered by Perseus, who uses them in an attack on the Dardanii. The Bastarnae are ultimately defeated and return homewards. While crossing the frozen Danube on foot, the ice gives way and most of their number are drowned. Son. Persuaded Philip to kill his pro-Roman brother, Demetrius. The use of the Bastarnae to attack Macedonia's enemies has forewarned Rome of Perseus' intention to break the restrictions laid on his father following Macedonia's defeat in 197-196 BC. Now Macedonia and Rome renew the fighting in the Third Macedonian War. Despite a refusal of support from Antiochus IV of the Seleucid empire, Perseus enjoys some initial success but is forced to surrender following defeat at the First Battle of Pydna on 22 June 168 BC. He is taken prisoner and transported to Rome by the victorious Roman general, Lucius Aemilius Paullus, along with his half-brother, Philippus, and his infant son, Alexander. Roman rule of Macedonia and Thrace follows the defeat of Perseus. The Antigonids are removed from power and the kingdom is dismantled and replaced by four republics. The rule of Macedonia and Thrace by the Roman republic followed the defeat of Perseus, the last of the native Macedonian kings. All around the eastern Mediterranean, the states that had been created by the Macedonian empire were falling to Rome, as was Greece itself, and the loss of Macedonia was a great blow for Greek freedom. Following their defeat at the First Battle of Pydna on 22 June 168 BC, the Antigonids were immediately removed from power and the kingdom was dismantled and replaced by four republics. Information on Roman governors seems to be very sparse, and multiple rebellions and uprisings occurred in Macedonia, but more especially in Thrace, which was still very tribal and prone to violent actions. The situation there calmed down in the first century AD following the near destruction of the Bessoi, one of Thrace's most warlike tribes, but incursions by tribes from the Danube area continued to be a serious problem. Andriscus of Macedon, ruler of Adramyttium in Aeolis, claims to be the son of Perseus and breaks the Roman hold over the former kingdom when he leads a popular uprising in the Fourth Macedonian War. Son of Perseus? Defeated by Rome. Andriscus invades Macedonia from Thrace in 149 BC and defeats an army under the Roman praetor, Publius Juventius. Then he proclaims himself King Philip VI of Macedonia. In the following year, his popular uprising is put down by the legions at the Second Battle of Pydna, and they establish a permanent residence in Greece. The Achaean League of Greek states rises up against this presence and is swiftly destroyed. Rome also destroys Corinth as an object lesson and annexes Greece, including Macedonia and Thrace. The four client republics are dissolved and Macedonia officially becomes the Roman province of Macedonia, which also includes Epirus, Thessaly, and areas of Illyria, Paeonia, and Thrace. With these regions under tighter control, Rome is free to take a tougher line against the recalcitrant Scordisci tribe in the Balkans and the various Thracian tribes to the east of Greece. Roman proconsul. Built the Via Egnatia across Greece. Having organised its forces in Greece, Rome makes its first move against the Scordisci by launching an offensive that, to its surprise, fails. The Scordisci repulse the attack and launch a counter-attack on Macedonia, although this is also repulsed. Thanks to this stalemate a period of peace follows. Indo-Scythians have long been pressing against the borders of the far distant Greek kingdom of Bactria. Now, following a long migration from the borders of the Chinese kingdoms, the Greater Yuezhi start to invade Bactria from Sogdiana to the north. Within a decade, around the time of the death of Indo-Greek King Menander in 130 BC, the Greater Yuezhi overrun Bactria and end Greek rule there. Although generally ascribed to 119 BC, Kazarov places this event in 117 BC. After a general period of peace lasting for more than fifteen years, the Scordisci manage to push all the way through the Roman defences, reaching the Aegean coast. The Roman governor of Macedonia, Pompeius, is killed during an attack on Argos. A force led by Quaestor Marcus Annius finally ends their adventure, pushing them back. 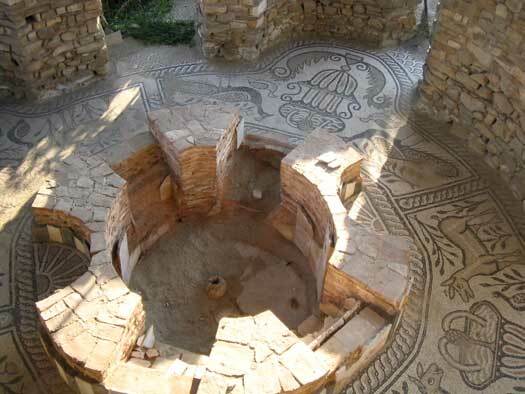 A subsequent attack by the Scordisci together with the Thracian Maedi tribe is also repulsed. The involvement of the Maedi tribe in the second attack marks the beginning of a new, more widespread involvement in the frequent campaigns between Romans and barbarians. While the Celts in Thrace and the lower Balkans continue to offer the biggest threat to Roman expansion, the native Balkan tribes frequently support them, especially the Bastarnae, Dardanii, and the free Thracian tribes (the Bessoi, Denteletes, Maedi, and Triballi). It takes this Macedonian raid to make Rome fully aware of the severity of the threat to its security in the region. Following the scare of 119 BC, former consul Quintus Fabius Maximus Eburnus is sent to Macedonia. Eburnus has established his reputation as a strict disciplinarian (and later goes so far as to execute his own son for 'immorality' in 104 BC, for which he is prosecuted). Plans are drawn up for the Roman conquest of Thrace, probably by him (according to Orosius, Pseudo-Quintilian, and Valerius Maximus). As part of this strategy a Roman fortress is established at Heracleae Sintica (modern Rupite, near Petritch in south-western Bulgaria) with a garrison of two cohorts commanded by one Lucullus. Located on the strategic Struma river valley, and possibly already inside Celtic territory, it is the only practical route for moving a large military force into western Thrace. The invasion begins in 114 BC, led by Consul Gaius Porcius Cato. Roman governor? Crushed the Bessoi. Greater retaliation is delivered by Rome when a Roman army enters Thrace under the command of Marcus Minucius Rufus. According to several Roman writers and also an inscription at Delphi (which is probably ordered by Rufus himself), both the Scordisci and the Thracian Bessoi tribe are defeated. If true it would be the first Scordisci defeat since 135 BC, or even earlier. The attack targets not only barbarian military means but, in a change to previous encounters, targets the civilian populations in a rather brutal manner. Rome triggers a pattern of increasing atrocities in its war against the tribes in Thrace and the Balkans. Interestingly, the campaign ignores the perils of the Struma Valley and instead proceeds along the much more open River Hebrus river valley (the modern Maritsa), which is much more suitable for a Roman army. It also seems to be aimed at the heart of the territory controlled by the previously peaceful Bessoi tribe, although it happily involves any other tribes, especially the Scordisci. As the Bessoi live along the Hebrus they make an ideal target without the involvement of dangerous forays away from the river valley. No territory is gained as a result of the raid, but it lays down a marker for the future. To take the gloss off the campaign's success, during their homeward march a large part of the Roman army drowns when ice on the river breaks underfoot. The attack on the Bessoi also turns them into one of Rome's most bitter enemies in Thrace, and forces them into forging closer links with the Celts in Thrace. While no further campaigns appear to be mounted by Rome during the closing years of the second century BC, the Scordisci and their Thracian allies, especially the Maedi, continue to attack Roman Macedonia. These attacks continue into the early years of the first century BC. Archaeology shows a dramatic increase in the levels of La Tène militarisation during this period, as Scordisci society gears up to face the continuing conflict. The constant warfare is also reflected in mass burials such as the one found at Slana Voda, where a large number of Celtic battle casualties are buried at the same time. 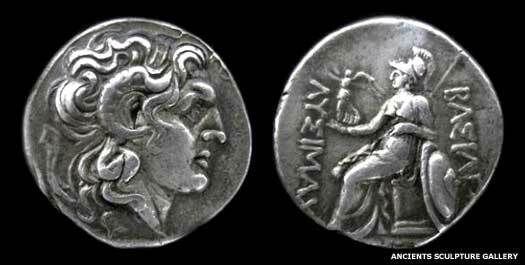 Hoards of Hellenic and Roman plunder are notable from the same period, especially in the form of coins, alongside Celtic issues which often depict attacks against Roman resources. 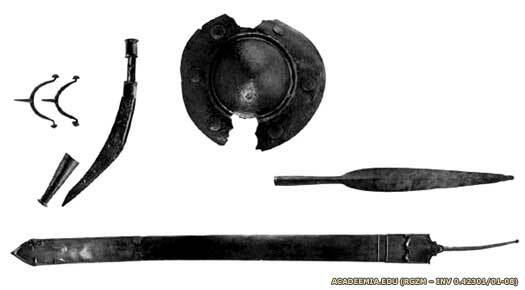 Finds also include a dense collection of La Tène swords in sites between the rivers Timok and Iskar in modern north-western Bulgaria - the largest concentration of such Celtic materials in Europe. Rome has sown the seeds of warfare and is now reaping the whirlwind of endless attacks by the new enemies it has made. Roman governor. Killed in the Roman Civil War in 87 BC. Rome's forces in the Balkans have increasingly been feeling the strain of the constant attacks on them. Now the dam bursts under the weight of yet another combined attack by the Scordisci and Maedi. The Roman historian Florus provides a detailed description of events. The Scordisci and Maedi, supported by the Thracian Denteletes and by the Dardanii, swarm through Dalmatia, Macedonia, and Thessaly, reaching as far as Epirus on the Adriatic. They vent the frustration of years of warfare against the Romans by freely destroying and plundering, although Florus paints a typically pro-Roman picture of barbarian atrocities, citing the Scordisci especially as 'the cruellest of all the Thracians... and to their strength was added cunning as well'. The attack deprives Rome of control over many areas of the Balkans and northern Greece. By this time the Scordisci and their allies have swept through northern Greece and have reached Dodona in Epirus. Roman accounts have them destroying the temple of Zeus there, one which the Romans themselves had destroyed in 167 BC and which, presumably, had been rebuilt by the Greeks in the meantime. The Romans are suitably outraged by the destruction of many other temples and similar sites that they had also destroyed in the previous century while conquering Greece. Rome is finally able to respond to their ongoing disaster in the Balkans and Greece. Sula leads an army against the Scordisci, apparently 'punishing' them according to Roman writers. Certainly prisoners are treated cruelly, with fire and sword being used to inflict severe cruelties upon them (so says Flores). However, Sula merely serves to further fan the flames. As soon as he leaves for Asia, the Celts and Thracians overrun the southern Balkans and northern Greece and penetrate the Peloponnese. They reach Delphi by the end of 85 BC to vandalise many of the religious sites there. Cornelius Scipio arrives to lead a fresh Roman campaign in the Balkans. Again, the effort appears punitive, with no long-term strategy to secure the territory. 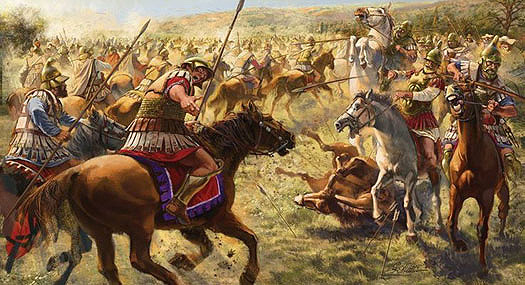 The Scordisci and Thracian tribes are undaunted by the action. Roman governor. Consul of Rome in 79 BC. Died on campaign. The new Roman governor of Macedonia, Appius Claudius Pulcher, leads a large army against the Scordisci confederation - the same Celts who had destroyed Cato's army and garrison in 114 BC. This time, however, the Scordisci employ different tactics. Pulcher's army is probably superior to Cato's, so he is allowed to penetrate the Thracian mountains unmolested. There, a vicious and drawn-out series of skirmishes and small-scale battles takes place between Romans and natives, with the Celts especially employing highly successful guerrilla tactics to wear down the opposition. Following months of constant alerts, illness, and defeats, Pulcher dies and the remains of his army withdraws from western Thrace. Roman governor. Consul of Rome in 76 BC. Died 53 BC. Despite the disappointment of 76 BC, Rome is making gradual progress in other parts of Thrace. The campaigns of Cnaeus Scribonius Curio in western Thrace from 75 BC see Roman forces penetrate the previously hostile Struma Valley to reach the Danube. They take large numbers of prisoners along the way, including a chieftain of the Maedi named Spartacus. Plutarch states that his wife is also taken prisoner. Some ancient sources state that Spartacus is in fact a Roman auxiliary who is later condemned to slavery, but all generally agree on his Thracian origins. Gaius Scribonius Curio occupies the lands of the Dardanii, and expands the province as far north as the Danube. In response to Rome's incursions into the Danube delta, which are seen as a major threat by all the peoples of the region, King Burebista of the Getae has united all of the Getae into a single kingdom. He has also established overlordship of the neighbouring Bastarnae and Sarmatians. Burebista's powerful forces raid regularly into Roman-held territory. In 62 BC the Greek cities rebel against Roman rule, and in the following year the Bastarnae manage to isolate the Roman infantry of the inept proconsul of Macedonia, Gaius Antonius (uncle to Mark Antony). The entire force is massacred. The Roman hold over the region collapses. Roman governor. His son returned in 11 BC to quell uprising. Rabokentus of the Bessoi is mentioned by Cicero in relation to action that is taken by Lucius Calpurnius Piso, to suppress unrest in the province. Rabokentus is murdered by Piso after the latter accepts a bribe from Kotys II of the Astean, a typical example of Roman officials playing off the native leaders against one another. During his reign, Raskouporis of Sapes has already granted assistance to both Pompey and Caesar during their struggle for power. Now, immediately after the murder of Julius Caesar, he supports the Roman republican faction under Brutus and Cassius against Mark Antony and Octavian. In return, Brutus and Cassius lead campaigns against the tribal Bessoi in the highlands in defence of their allies. The Bastarnae cross the Haemus in support of the Scordisci in modern north-western Bulgaria. They attack a Thracian tribe known as the Dentheletae who are allies of Rome. General Marcus Licinius Crassus, proconsul of Macedonia, goes to assist the Dentheletae with help from the Getae under King Roles, and the Bastarnae withdraw. Crassus follows them and eventually engages them in battle. Caught unawares, the Bastarnae are routed and their king is killed in combat with Crassus. According to Roman writers, thousands of Bastarnae perish in the ensuing slaughter. Dio Cassius Cocceianus reports that Marcus Licinius Crassus undertakes a punitive expedition against the Thracians (in what is now southern Bulgaria), mainly against the Bessoi. The ancient sanctuary of Dionysos, described by Herodotus, is captured, taken away from the Bessoi priests and priestesses, and delivered to the Astean, who are Roman allies. The Bessoi do not accept the settling of these Odrysian Thracians in their ancient sanctuary and revolt. This first uprising is quickly suppressed. Crassus also 'punishes' the Scordisci tribes of north-western Bulgaria. By this time Rome has engaged the Thracian kingdom of Sapes to act as a proxy government over local Thracian affairs and to oversee the gradual Romanisation of the region. It seems that Thracian resistance to Rome to any substantive degree has finally come to an end. King Kotys III of Sapes is killed by Raskouporis II. Roimitalkes II, the son of the victorious king is given the lands to the north of the Haemus in Thrace while Kotys' son, Roimitalkes III gets the lands to the south, both ruling under the guardianship of the Roman governor of Macedonia. The Celts of the former Scordisci confederation have one last surprise remaining for Rome. As imperial Rome stamps its authority on the Balkans, Celtic tribes swoop down from the Thracian mountains. They swarm into Macedonia and lay waste to the Roman province once again. The attack surely comes from the Rhodope Mountains in south-western Bulgaria, making it the last hurrah of the Scordisci and providing Rome with a brutal reminder that although the cities and plains may be civilised, the mountains of central and western Thrace are still areas to be feared. Vologeses is a Dionysian priest (and possible king) who leads his fellow mountain Bessoi in one of the most prolonged uprisings against the Romans. Their initial aim is to free and re-conquer the sanctuary of Dionysos. Other Thracians join the uprising, and it quickly grows into a storm. Dio Cassius relates that a number of regions in Thrace are ravaged and the Odrysians of Astean are persecuted by the revolting Bessoi. Raskouporis II of Astean is killed and his relative, Roimitalkes I of Sapes, is forced to seek protection from the Romans. To suppress the uprising, the Romans receive help from Pamphylia, and under Lucius Calpurnius Piso Caesoninus, son of former Governor Lucius Calpurnius Piso, they manage to quell the revolting Bessoi by drowning the country in blood and fire. With the formation of the new Roman provinces of Dalmatia, Moesia and Thrace, the province of Macedonia acquires the physical dimensions that it retains throughout the empire period. It also gains safety and security at last, with the Thracian tribes fully pacified and external threats kept away by the buffer provinces around it. The long-since isolated and very distant Indo-Greek kingdom disappears under Indo-Scythian pressure. It seems to be Rajuvula, kshatrapa in Mathura at this time, who invades what is virtually the last free Indo-Greek territory in the eastern Punjab. He kills Strato II and his son. Pockets of Greek population probably remain for some centuries under the subsequent rule of the Kushans and Indo-Parthians, and a possible enclave of Greek rule is apparently maintained briefly in Paropamisadae. The Peucini Bastarnae are specifically mentioned in the invasion across the Roman frontier. Part of the barbarian coalition which includes Goths and Heruli, they use their knowledge of boat building from several centuries of living on the Black Sea coast and in the Danube estuary to help build a fleet in the estuary of the River Tyras (now the Dniester). The force of which they are part sails along the coast to Tomis in Moesia Inferior. They attack the town but are unable to take it. Sailing on, they are frustrated twice more, at Marcianopolis and Thessalonica in Macedonia. Athens is also attacked, captured, and plundered by the Heruli (in 267-268). Finally, they move into Thrace where they are crushed by Emperor Claudius II at Naissus in 269. Following reforms by Roman Emperor Diocletian at the end of the third century, Epirus Vetus is removed from the province of Macedonia. In the less well-recorded fourth century, Macedonia itself is divided into Macedonia Prima (the south) and Macedonia Salutaris (the north). In 318 they form part of the diocese of Macedonia, one of three dioceses which is included in the praetorian prefecture of Illyricum. Greece becomes the central segment of the Eastern Roman empire. It remains so until the Byzantine empire's final conquest in 1453 by the Ottoman empire. Only in the twentieth century does an independent Greek kingdom rise out of two millennia of Turkic occupation or Romanised empire. However, by that time Macedonia, on the northern edge of Greece's territory, has been influenced by later arrivals, such as early Slav groups in the fifth and sixth centuries, and at least one major group of Bulgars in the seventh century.